Puzzle Dimension ($10, free demo) is a 3-D puzzle game which requires a little bit of timing and finesse to get a high score--but relies mostly on logic. You manipulate a rolling ball across a framework of tiles arranged in three dimensions, forming loops, curves, and straightaways. To activate the portal and move to the next level, you must roll the ball over all of the sunflowers....continuing the long-standing video game tradition in which any attempt to describe gameplay sounds like you're recounting a strange LSD experience...as told to you by a friend. 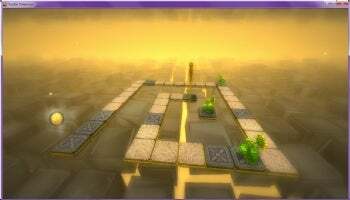 A mix of logic and trial and error is needed to hit every sunflower and open the portal in Puzzle Dimension. The "puzzle" part of Puzzle Dimension comes from the variable nature of the tiles. Some tiles will destroy you if you pass over them, so you may need to jump them, or find a way to turn them off. Some do not allow you to stop, while others do not allow you to move (though you can still jump). Some will bounce you several squares, and so on. While there is a manual which describes each tile and its effects, the tutorial portion of Puzzle Dimension does not introduce any of the unusual tiles, so if you just do the tutorial and then play, you'll need to discover the "rules" for each tile by trial and error. Once you know what the tiles do, you can often work out the puzzle logically before moving... if you can see everything you want to see from the correct angle, which brings up my one complaint with Puzzle Dimension: I sometimes found the camera annoying. Overall, Puzzle Dimension is fun and challenging, with a unique graphic look and plenty of achievements to collect, giving you something to do besides simply solve the puzzles. At ten dollars for one hundred levels, it definitely provides entertainment value for the money.